So I had a bit of a fun idea for this Saturday. While the idea might not be terribly original or clever, I wanted to set this Saturday aside as a "sample Saturday", a day where I can explore a few brands that I've been sampling several bits from and let you know my thoughts on the line as a whole. Today I want to focus in on two different brands, one this morning and one later this afternoon. 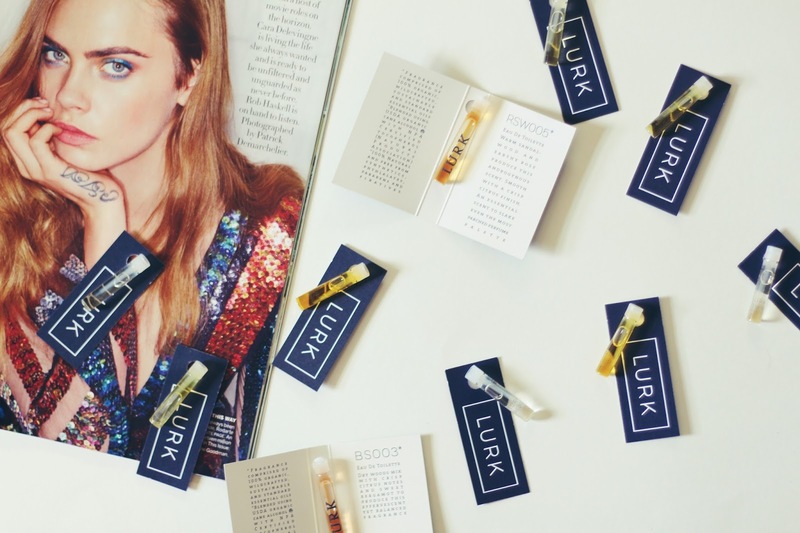 So for right now let's talk a little bit about one seriously amazing natural fragrance brand, the infamous Lurk Perfumes. The brand is made up of ten different perfume oils, all long-lasting, beautiful scents that are so unique that sometimes you feel like they were made personally for you. I was lucky enough to try out every scent from the line, and can honestly say that each and every formula is so well thought out and brilliant. If I had a choose a few favorites, I'd have to say that TRN V4*, RSW005* and PRJ V1* are the three that I have been wearing on a daily basis. RSW005* is a combination of sandalwood, rose and citrus, an uplifting and lightly floral scent that is perfect for warm summer days. PRJ V1* is a combination of jasmine, rose and petitgrain that comes across to me as a beautifully girly scent. It's pretty and unique, with a scent that I'd almost describe as a fresh floral. I'm a huge fan of the scent of roses, but often find that in perfumes they smell almost synthetic and fake. With both these gems though, it is pure rose and you can immediately tell the difference, even if you're a perfume novice such as myself. Finally, TRN V4* is a combination of tobacco, Neroli, rose and lavender that is beautifully floral and yet incredibly lightweight - never cloying. I knew before I even smelled this one that I was going to love it. Rose, Neroli and Tobacco (as in the flower, not cigarettes) are three of my favorite scents, and I had never seen them combined before. This is a scent that really feels so personally "me" - I've always been so jealous of people who talk about having a "signature scent", but I honestly think I've found mine with this gem. I've been savoring every last drop of this sample for daily use (and still have some to spare weeks later!) but I already am saving up for the full size. I've never found a scent I love this much and I cannot say enough great things about it. Have any of you tried a Lurk perfume before? Let me know what your favorite is, or which you are most intrigued by, by leaving a comment below!